Should You Buy Soilbuild REIT Now? Recently, Moody’s Investors Service has changed the rating outlook for Soilbuild REIT to negative from stable. Soilbuild REIT overall portfolio occupancy also fell to 92%. Below I evaluate the risks versus the positives and whether you should enter into a position with Soilbuild REIT right now. The SGD11.8 million that Soilbuild REIT receives from the default of Technics Offshore Engineering Pte Ltd will be exhausted in Q3 2017. Soilbuild REIT will have to find a new tenant to replace the missing revenue. Recently, Soilbuild REIT announced the proposed acquisition of Bukit Batok Connection for a total of SGD100.49 million. This will be voted and concluded in the upcoming extraordinary annual general meeting. The acquisition will be funded by balanced mix of unsecured debt and equity. The aggregate leverage of 35.9% allows Soilbuild REIT to have a further debt headroom of S$84 million. 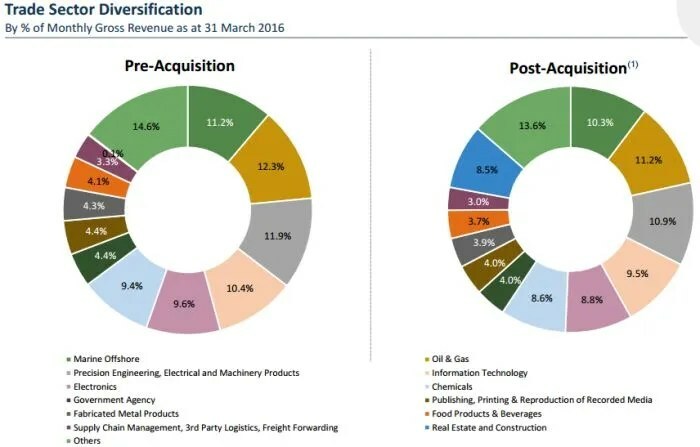 Do note that REITs in Singapore has an upper gearing limit of 45%. The lease for Solaris is expiring in FY2018. With the current headwinds in the industrial sector, industrial space demand continues to weaken and there is potential for a further decline in occupancy rate. If the acquisition of Bukit Batok Connection goes through, the property will contribute S$8.0 million rental in the first year followed by an annual rental escalation of up to 2.0% annually. If the acquisition of Bukit Batok Connection goes through, Real Estate and Construction will take 8.5% of its portfolio. This diversifies some form of risk as compared previously whereby Soilbuild REIT is concentrated in the Marine Offshore sector. Soilbuild REIT currently makes up 3% of my stock portfolio. If you are looking into entering a buy position with Soilbuild REIT, my advice is to wait for the clouds to clear before deciding given the current risks outweigh the positives right now.